Registration forms for summer baseball skills camps are now available. The camp will be held July 25-27. Each camp is $60 and there is a sibling discount available. 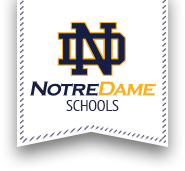 The Notre Dame Skills Camp is designed to provide campers with personal attention to advance their baseball fundamentals. Out camp will offer individual andgroup instruction in all phases of the game of baseball. Our staff will provide proper instruction and drills to enhance the skill level of each individual. Campers will be instructed in fundamentals including: hitting, pitching, infield, outfield, catching, base running, bunting and sliding.